It’s the beginning of growing season and I couldn’t possibly be more excited! I have some really big plans for my yard and garden this year – I’m going all in and I can’t wait to share it all with you in the coming months. I’m in the planning stages at this point and soon I’ll share the plans and hopefully get some advice. A few years ago if you asked me what my hobby was I would not be able to tell you anything. I enjoy things like cooking and crafting and photography but I never considered anything to be my hobby. The more I reflect on how much I love plants and gardening the more I am realizing that this is seriously my hobby. It’s the one thing in my life I am really willing to invest in. I look forward to visiting nurseries and plant stores. I love doting on my plants daily, making sure they aren’t dried out and are growing OK. My husband thinks I’m a little crazy but I literally can’t help myself. If it came down to buying clothes vs buying plants or tools to help me grow plants I’ll always spend the money on plants. I’ve been trying to think back on when this love of mine came about. 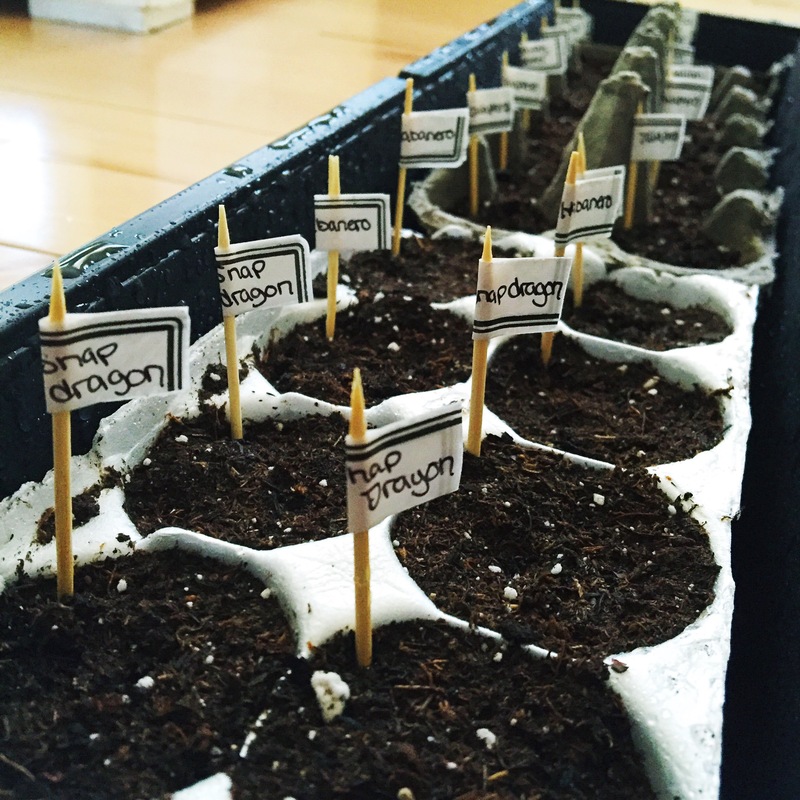 How did my love for growing things expand and when did it start? I spent the first 10 or so years of my life on a farm surrounded by the culture of growing food both animals and plants. My parents grew lots of things in the fields and we also had a huge garden that was planted each year and I was always part of the garden planting. Then we moved off the farm but still we always had a garden, in my teens my only part of the gardening was picking the carrots and peas for a snack. Regardless, those years at home being surrounded by that culture of growing your own food has obviously had an impact on me. I have such fond memories of planting and weeding and harvesting I’m sure that’s where the love started. Now that I have my own house and room to grow some of my own food that love is expanding. I can’t wait to document and learn throughout the growing season this year and I can’t wait to share with you! 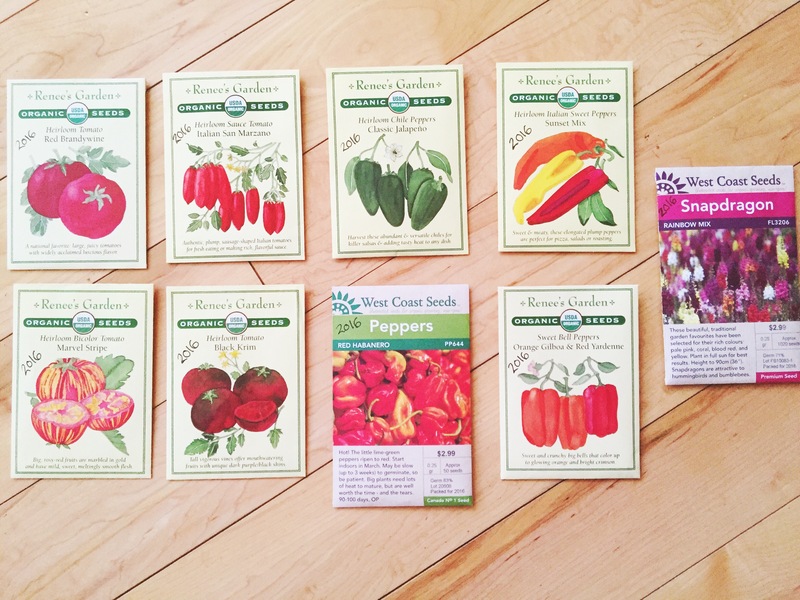 I have some more seed shopping to do but I needed to pick up some tomato and pepper seeds to get started last week. I may be going overboard but I figure I can also gift some plants if I need to. 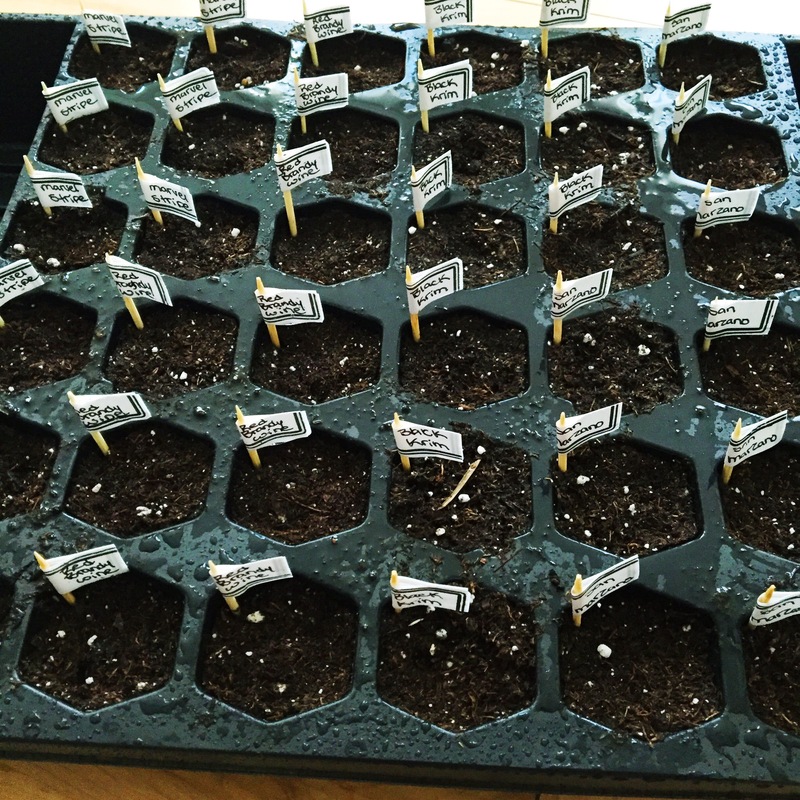 So far I’ve started 4 types of larger tomatoes: Red Brandywine, Italian San Marino, Mixed Stripe, and Black Krim. I’m also planting a lot more peppers this year: Habanero (our most loved and used pepper in our house), jalapeno (probably will gift most of what we grow but I really wanted to try), and two types of sweet peppers for roasting and sauce making. I couldn’t resist picking up a pack of snapdragons to start either. I really want to try and grow mostly organic seeds this year. They are pricey but will be worth it! The snap dragons and peppers have a much longer germination time then the tomatoes so I planted 4 of each kind in a seller are seed starting tray so that I didn’t have to try and figure out how to separate them like last year. I ended up just using egg cartons to plant them because it’s what I had but I am noticing some weird growth that’s not the plants in the styrofoam cartons. I suspect it’s from all the humidity but I hope it doesn’t interfere with the germination. I planted 36 tomato plants in total- 9 of each variety and I was much more careful at labelling this year. I planted everything on February 25 and as of today all but 1 tomato has germinated. 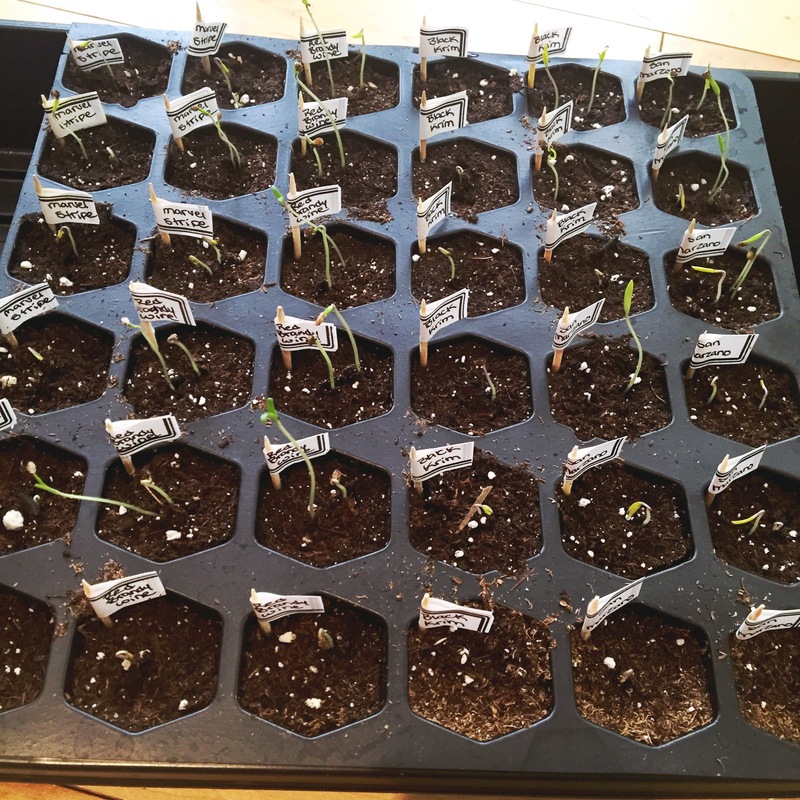 I used a regular potting soil instead of a soil free seed starting formula. I did this for a couple reasons: it’s what I had and also I don’t have to transfer these so quickly into pots which gives me some more time to work out how the heck I’m going to grow all these until they are planted in the garden. Get ready for so many gardening posts to come! This entry was posted in Gardening, Simplified Living and tagged ABOVE GROUND GARDENING, ALBERTA GARDENING, BUDGET FRIENDLY, CALGARY GARDENING, EAT LOCAL, GARDEN, GROW YOUR FOOD, JOY IN SIMPLICITY, JOY OF SIMPLICITY, LIVE SIMPLY, NATURAL LIVING, SIMPLE LIVING, SIMPLIFIED LIVING, URBAN FARMING. Bookmark the permalink.